BIRMINGHAM, Ala. -- A paralyzed former football star from Alabama stood up for the first time in 10 years, after a long journey of physical therapy and prayer, he told ABC News. Timothy Alexander, who was injured in a horrific car crash and worked diligently in rehab, was able to stand Monday for a few minutes and unassisted for a few seconds, his physical therapist said. "I have a stand up chair...normally if they take the brake off I fall straight down," he said. "I was able to hold myself up for about three seconds." A decade ago, Alexander, 27, was his high school's star football player, confident he could go to any college he wanted with a football scholarship. "Before my injury I was ranked number eight in the state and I could have went anywhere," Alexander said. Tragedy struck in October of 2006, when Alexander got into a devastating car crash after his friend fell asleep at the wheel. He described how the car swerved off the road toward a cliff, all while he was holding a 2-year-old baby on his lap. "I punched the window out, I threw the 2-year-old baby out the window, before we went off the cliff. The car went all the way down, I became paralyzed instantly," Alexander said. "My friend said 'Is everyone okay?' and I said, 'No, I can't feel my legs.'" For a while, Alexander said he was paralyzed from the neck down, but treatment and therapy helped him gain use of his upper body again. "I had traumatic brain injury. I couldn't read, couldn't write, couldn't do anything. When I tried to talk to my mom they put a marker in my mouth and tried to make me move my head," he said. "When I first had my car wreck I had a lot of doctors and therapists that did give me a chance, but after my insurance ran out they said there was nothing they could do," Alexander said. "The first year I was very suicidal." Alexander said he spoke to his bishop and his family and "embraced a positive attitude in 2008." "I just started working out and praying. I had a dream of me playing football at UAB [University of Alabama at Birmingham]," Alexander said, and he went to the UAB gym for physical therapy. "When I went to training room, the sports trainer said 'hey, are you here to do football?' and I said 'Are you talking to me?'" 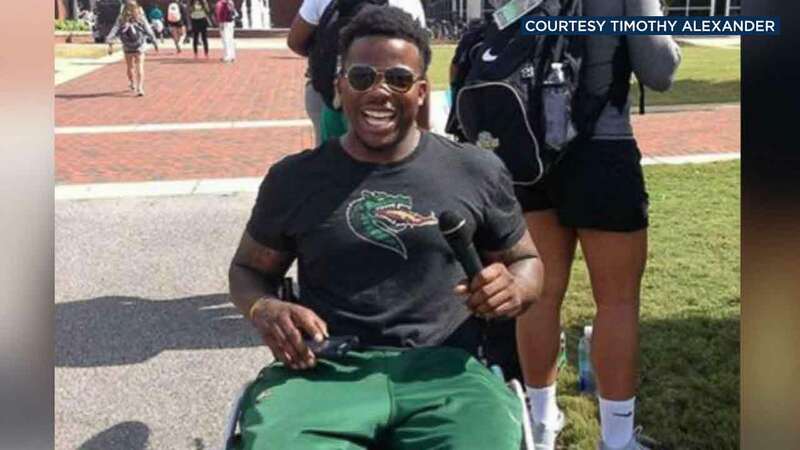 Alexander told ABC News he then became the first paraplegic to ever get a scholarship in Division I football. He attended every practice and game and served as a motivator for his teammates. Despite being on a Division I football team, Alexander still could not stand up on his own. On Monday, however, that changed. Natalie Shannon, Alexander's physical therapist and athletic trainer, told ABC News on Thursday that she was thrilled when she saw him stand up, completely unassisted, for the first time. Shannon added that everyone has different injuries and responds differently to therapy, but Alexander has always been very hardworking toward his goals, training with a standing chair as often as he can to build up muscle. Alexander says he was inspired to never give up by his older brother, who passed away in a house fire, who told him to set his sights high. "My big hero was my big brother David," Alexander said, "he passed away on April 14, 2006." "The day before he passed, he said 'I want you to go to the NFL and make a great name for yourself, to take care of the community and the family,' and he said, 'I love you,' and that was the last words he said." Alexander said he still hopes to realize his brother's dream of being drafted into the NFL "not for money or fame, but to show that if you believe that all things are possible," you can achieve your goals. Alexander hopes to work as a motivational speaker, and inspire others with his journey to not give up hope.